ENHANCE YOUR MOOD AND INCREASE YOUR ENERGY IN A NATURAL WAY! 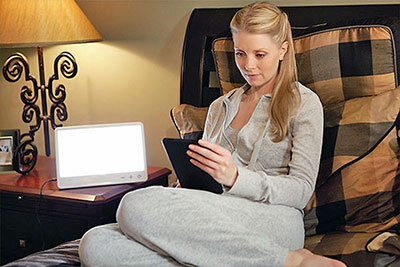 The Aurora LightPad MAX™ light box is the largest LED box on the market, with 600 bright white LED lights to help you combat the symptoms of seasonal affective disorder, winter blues, sleep disorders and other mood disorders. Website Exclusives: "14 Days to Happiness" PLUS 1-on-1 S.A.D. Phone Support. "I was surprised at how easy it was to use the Aurora LightPad MAX. 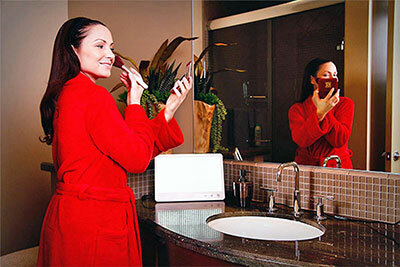 It's small and compact, making it easy for me to use anywhere in my house." Increased Energy & Enhanced Mood. Compact, Portable & Light Weight. Low-High Intensity Control. Durable LED Lights. 60 Day Money Back Guarantee. 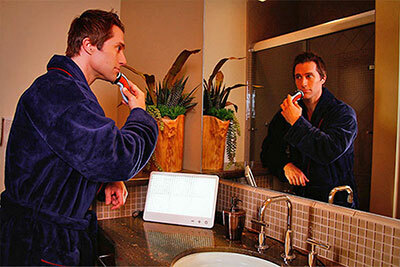 Enhance your mood and increase your energy in a natural way by using the Aurora LightPad MAX™ light box today! The Aurora LightPad MAX™ light box is the largest LED box on the market. 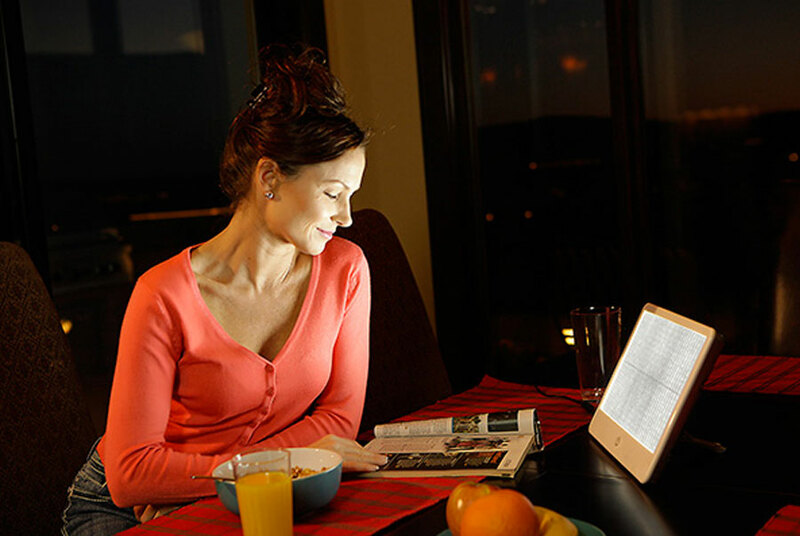 The Aurora LightPad MAX™ light box uses 600 bright white LED lights to help you combat the symptoms of seasonal affective disorder, winter blues, sleep disorders and other mood disorders. LED lights have a longer lifespan without using mercury or emitting harmful UV rays. 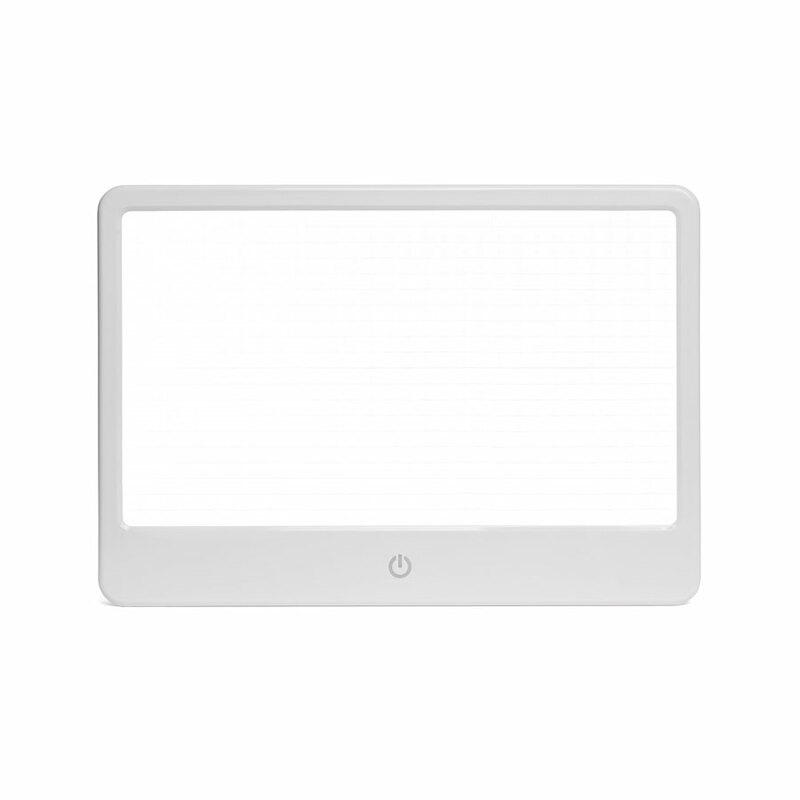 Since LED bulbs are much smaller and more durable than fluorescent light bulbs, it helps make the Aurora LightPad MAX™ light box compact for use and travel. Although LED light bulbs cost more to produce, LED bulbs last much longer. Incandescent bulbs burn out when the filament breaks. But since Aurora LED lights don't use a filament, they can last as much as 100 times longer than a normal incandescent bulb. 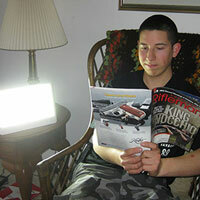 By using Aurora LED lights in the Aurora LightPad MAX™ light box, you will never replace a bulb again. The Aurora LightPad MAX™ light box is 10,000 LUX @ 30" and also has a built in fully adjustable stand. You can control the angle of the light with thirteen different angle options. With the low-high intensity controls, you can choose the right level of brightness to reach your desired comfort level for light therapy treatment. Output 10,000 LUX @ 30"
Reviews for "Aurora LightPad MAX™"
"I recommend both the NorthStar 10,000 and the Aurora LightPad MAX for all my patients that suffer from Seasonal Depression and Seasonal Affective Disorder. 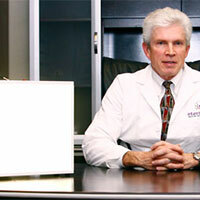 I am a true believer in bright light therapy and have numerous patients benefit from this treatment. It is a natural and safe treatment that is incredibly effective." 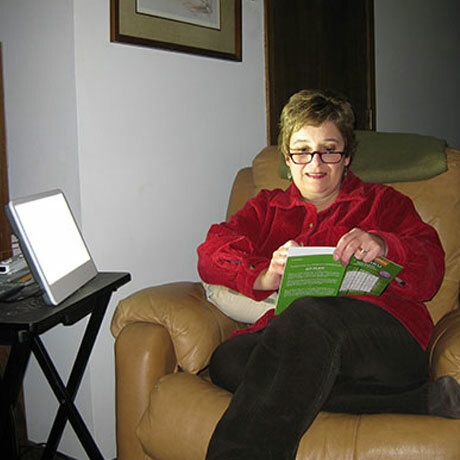 "I was surprised at how easy it was to use the Aurora LightPad MAX. It's small and compact, making it easy for me to use anywhere in my house, and I couldn't believe how bright it was. It is a great alternative when there isn't sunshine." 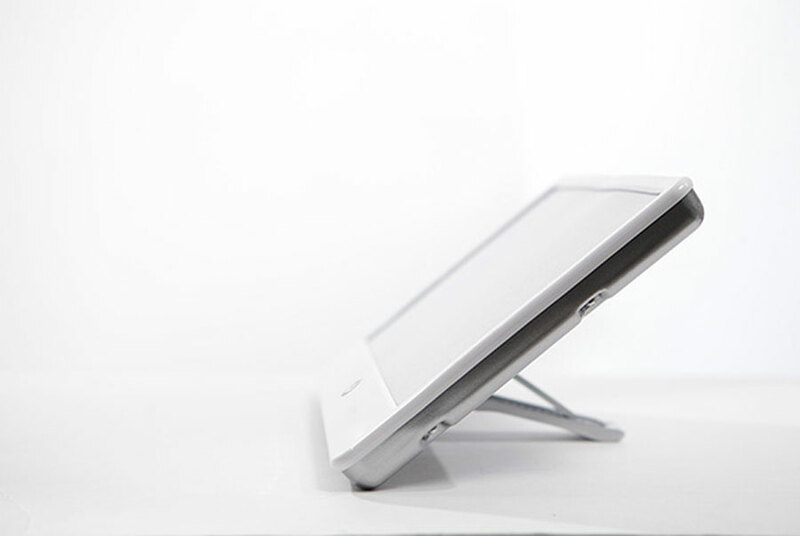 "The first thing that drew me to the Aurora LightPad MAX was the size of the light. 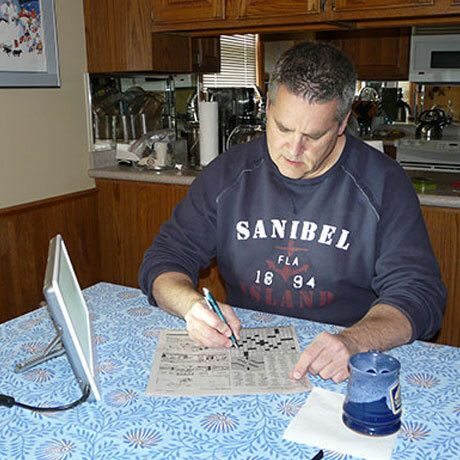 As you can see, it is perfect to set up on my side table, and makes it easier to read…or play a little sudoku. For such a small light, it emits a lot of light, which makes it easier when I'm using the Aurora LightPad MAX in the morning. I would definitely recommend buying one!" "I bought the lightpad to help with my winter blues. We had a long and dark winter and I was ready to try anything to make a positive impact. A few points I liked about it: It's small and easy to move around. I like the easy buttons on front, which adjusts the brightness. I also liked how it had an attached, adjustable stand. Great product." 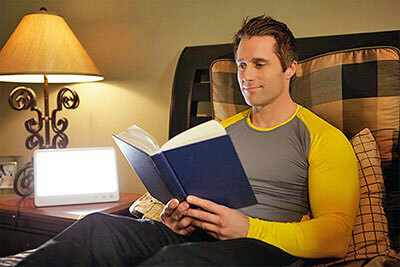 * Since the 1970's, studies have shown that light therapy treatment is effective when a person is within a 10,000 lux brightness range of light. This is important to consider when shopping around. Many lamps boast of 10,000 lux light, but fail to mention at what distance this is from the light unit.